Irish family history is notoriously difficult. We know, as we’ve spent the last 18 years helping customers find their way. It's all become a lot better now that so many more records are online, but there is still a big gap between what hobbyists know and what they need to know to achieve success. In short they need easy access to help and expertise. 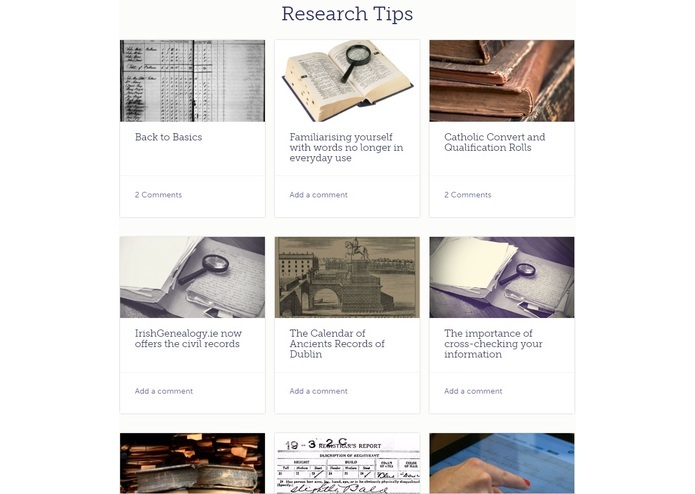 None of the major genealogy web sites are particularly good at providing help, or getting hobbyists to connect with each other and share research problems. Our customers want a home for their research journey, tailored for their needs, and providing the expert help & resources and social engagement unavailable elsewhere. Our motivation was to share our knowledge and expertise in the most convenient and friendly way possible. 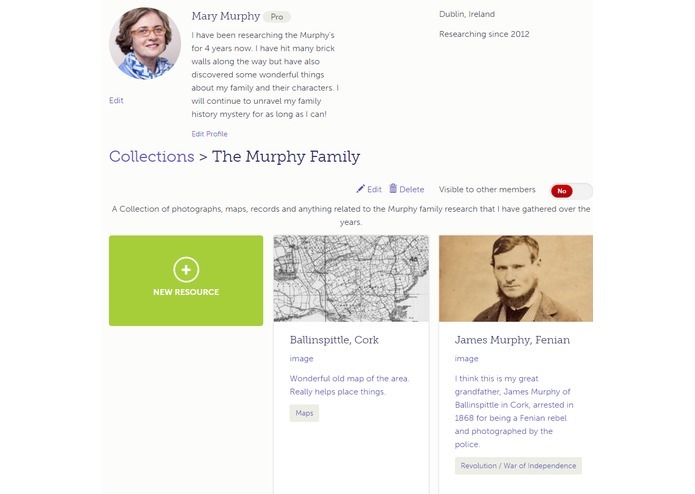 We wanted to create a website for our clients to store all their Irish genealogy work, where they knew there was always an expert at their side to help them. In essence the real inspiration for this website was our customers and their wants and needs in Irish research. 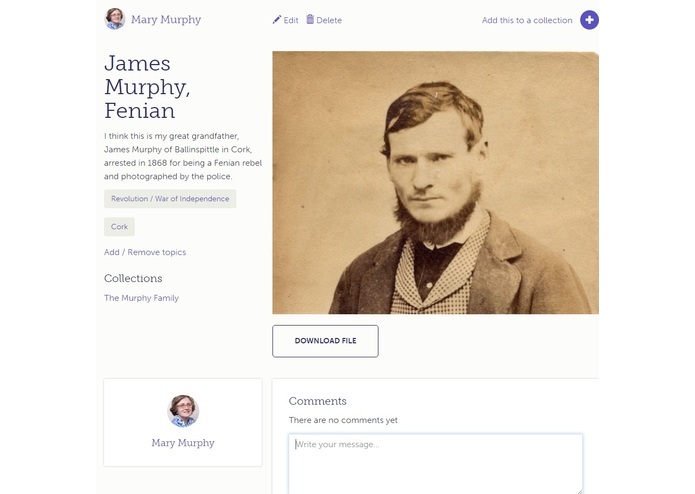 In a nutshell, this website makes Irish Family History easier for everyone. Of course there are many websites out there that provide Irish records but sometimes a record is not enough. 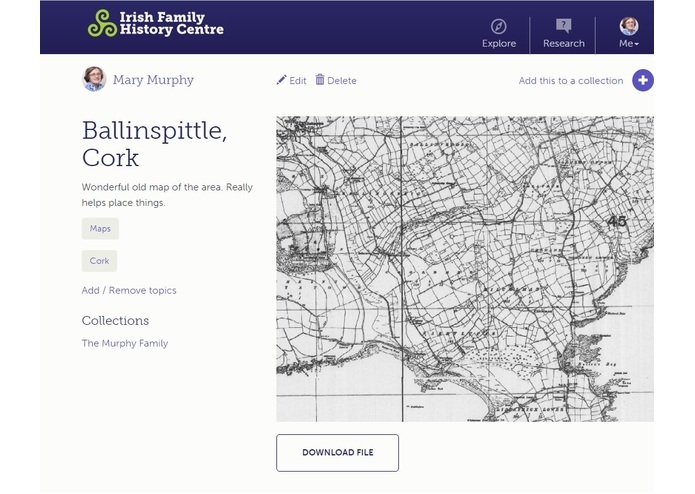 Our site allows you to find out more about certain topics, events, resources and places all related to Irish genealogy which in return will make your research much more enjoyable. It allows you to create a profile where you can select your areas of interest, follow other users, follow and comment on other’s posts and build research collections. It allows you to become a part of a genealogy community where everyone engages with each other to offer their collective knowledge and assistance. 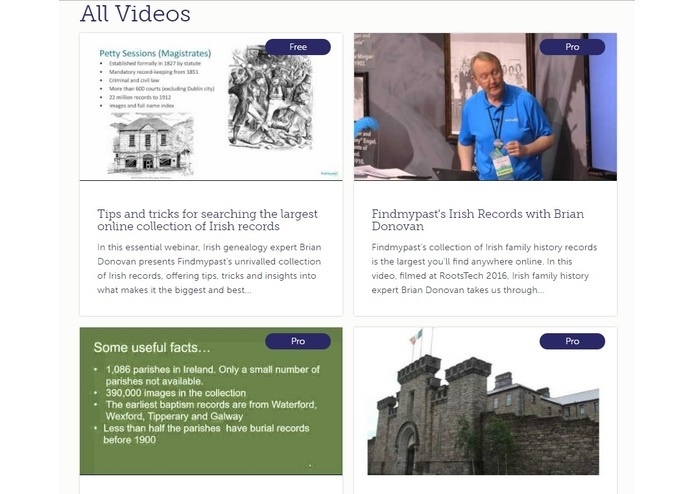 It allows you to find out more about certain topics, events, resources and places all related to Irish genealogy. It creates a hub where you can receive expert help when you need it. Over the course of 18 months, in conjunction with a handpicked team of developers and specialists, we carefully crafted all the various components into one beta site which went live in May 2016. It is a bespoke website using the Laravel framework in PHP. Laravel follows the traditional Model-View-Controller design pattern. Controllers are used to handle user requests and retrieve data, by leveraging Models (e.g. Users, Articles, Resources, Collections, Publications, Topics). Models interact with the database and retrieve information about the various items used (e.g. get a list of all Publications related to Co. Wicklow). Views are used to render the pages, providing the interface by which users interact with the website (e.g. display an Article with related user comments beneath it). We have been continuously modifying the site as bugs and flaws are discovered and as we receive feedback from customers. This process will continue for the immediate future. Functional Design was our first hurdle. We knew what the site needed to be able to do, but providing this functionality in a seamless and easy to use manner was a challenge. Trying to co-ordinate and implement our ideas was one of the greatest difficulties. Visual Design: Making final decisions on the overall colour scheme, flow and design was another challenge we faced. We knew we were providing a great new innovative service but we wanted the overall look and navigation to match this perfectly. It was also the launch of a new brand so an entirely new brand design had to be created. Branding: Naming our website was also a bit of a challenge as again we needed to keep the customer in mind and really focus in on what it is they would be looking for. 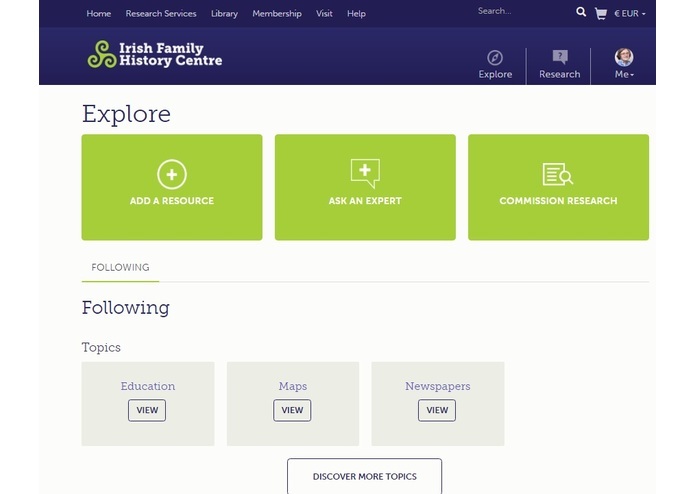 In the end we felt Irish Family History Centre was a good fit as the website really is the online centre for Irish genealogy. Functionality: It works! All the moving pieces we included link together seamlessly. The social side, the resources, the uploads, collections, records, interaction, etc., all knit together as planned. 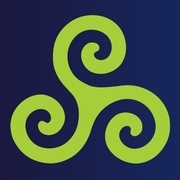 We are proud of creating what we see as an “Irish home” online for anyone in the world to access. We pride ourselves in the fact that even though our clients may be halfway around the world we can still provide the knowledge and resources they need to help them on their family history research journey. We love the fresh new look our website has and the easy navigation that allows our users to browse at ease with its engaging imagery and exciting content. The educational factor also plays a huge role for the website as we are teaching students on a monthly basis at our visitor centre more and more about Irish Genealogy and heritage. They are using the website as a place to store all their work and research as they go. 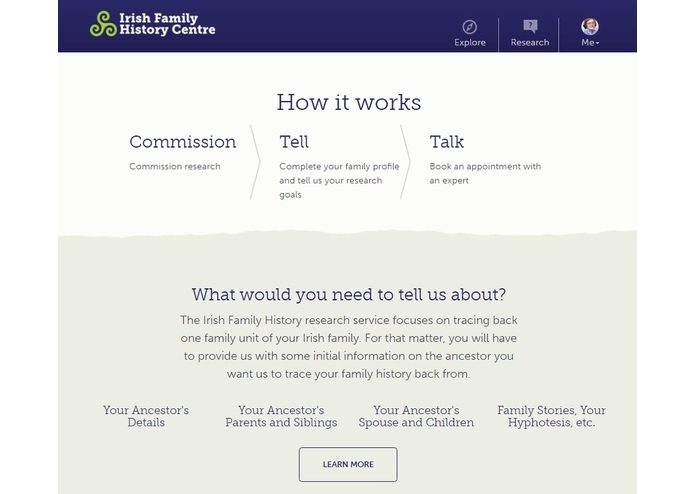 We learned a lot from our journey developing this website, mainly about who our customers are and what it is they are looking for, and in the end we found they just wanted something to make their Irish family history research easier and more enjoyable. Once we had this figured out we knew we had the key to creating something quite special. Our biggest technical learning was the relative advantages and disadvantages of bespoke systems versus using established components. We also learned that anything is possible with a strong creative team around you, and that hours of brainstorming and coffee can lead to great things. 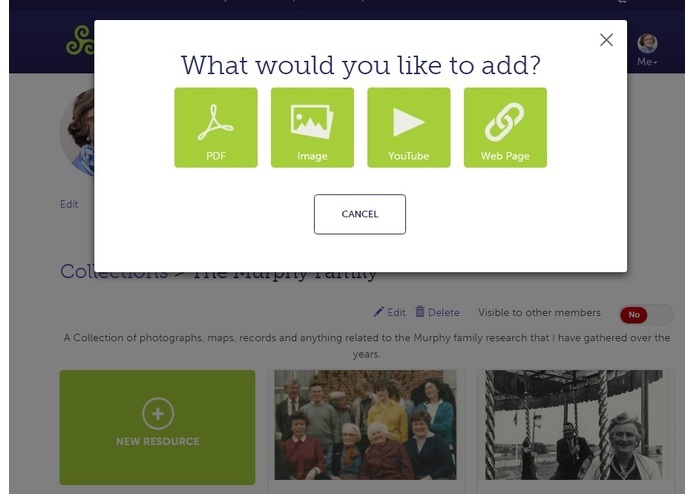 We feel the next major steps are around providing users with other ways to share their research and stories via family trees, innovative display of their work, more social engagement, better access to rare resources, support and edutainment. We are an award-winning history and heritage company based in Dublin, Ireland. 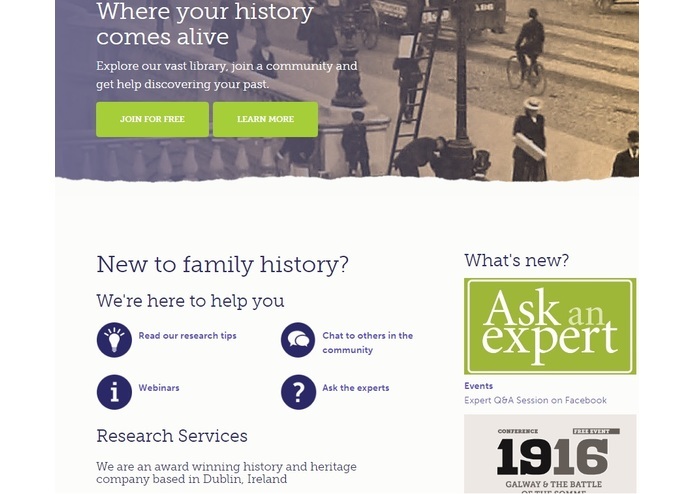 And are the largest genealogical research service in Ireland.